I’ve recently received a complementary book entitled “Texas Instruments FRAM MCUs for DUMMIES” sent by Mouser, that provides technical and practical information about FRAM (Ferroelectric Random Access Memory) – pronounced F-RAM – and Texas Instruments MSP430FR57xx MCU series which makes use of this relatively new type of memory. 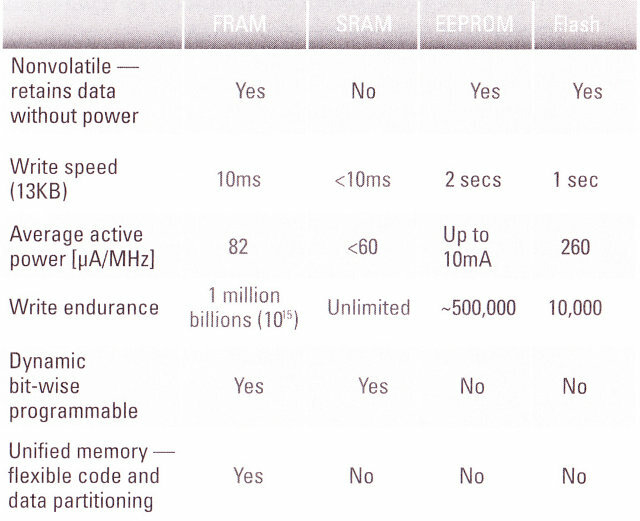 FRAM is a non-volatile memory with power and write speed & endurance characteristics that almost matches SRAM capabilities, and leave traditional Flash and EEPROM memory in the dust in terms of performance, as you can see from the table and diagram below. 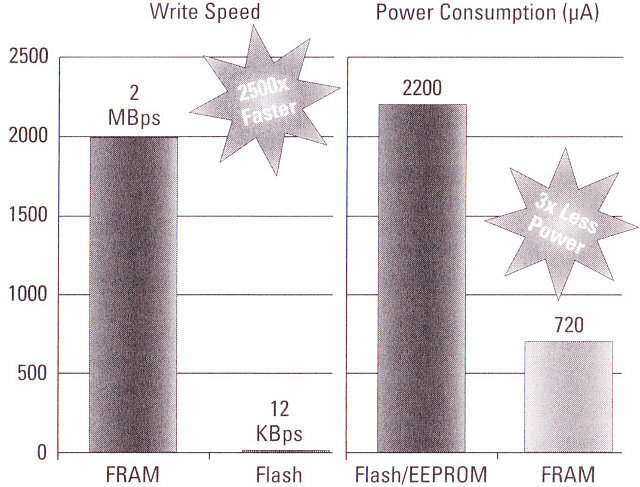 At constant speed, FRAM consumes 250x less than Flash/EEPROM. Please note the FRAM write speed also depends on the MCU used, and a MCU @ 8MHz can write the FRAM @ 1400 kBps (Source: TI). However, you won’t see this type of memory in devices like smartphones anytime soon because the maximum size currently manufactured is 1MB, density is higher (130 nm process manufacturing) and the cost is higher than traditional DRAM + Flash combination. This is why FRAM are currently used in applications that require ultra low power consumption and non-volatile storage write capabilities such as data logging, sensor networks, batteryless applications and wireless networks where OTA firmware upgrade may be required (This lowers the maintenance costs). This is why FRAM is currently inside some micro-controllers as a replacement to built-in SRAM and Flash. In the diagram below, you can see three type of MCU with embedded flash and MCUs with embedded FRAM. One key advantage of MCU with FRAM is that the memory map can be configured as RAM (R/W) or to store code and constant (Read only). For example, if your program requires 3KB or RAM and 10 KB to storage code and data, a 16 KB FRAM MCU would be suitable, but you may have to select a “traditional” MCU with 32 KB Flash and 6KB SRAM to achieve the same functionalities. FRAM MCUs are more flexible, and it may cost less depending on your requirements. Finally, FRAM has also much better resistance to radiation than Flash or EEPROM and is immune to magnetic fields, which may be an advantage for some medical applications, for example. 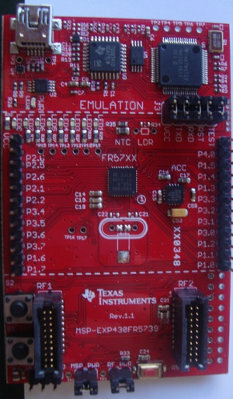 Texas Instruments is one of the few companies that provide FRAM 16-bit MCUs with their MSP430FR57xx series and (upcoming) MSP430FR58xx/59xx “Wolverine” MCUs which feature 4 to 64 KB FRAM, 1 or 2 KB SRAM and with MCU frequencies of 8, 16 24 MHz. The experimenter board can be purchased on TI e-Store or distributors for $29. There’s also a training workshop that you can attend online, visit MSP430 FR57xx Training Workshop for details.